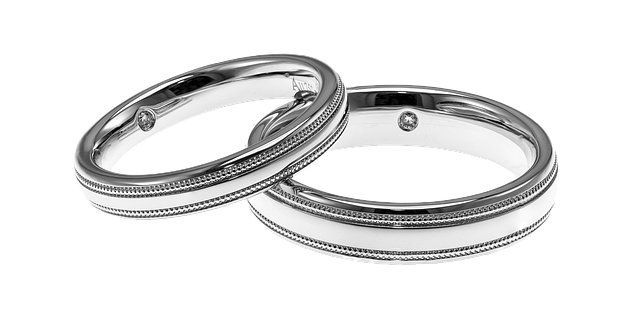 White gold and silver may look very similar and are often used making precious jewelry such as necklaces and wedding bands. Both of these need to be polished regularly to prevent tarnishing. For most people, it is difficult to tell which one is which with the naked eye. White gold is usually coated with rhodium, manganese, palladium, or nickel which is a kind of white metal that enhances strength and luminescence. As for silver, it is often combined with copper to give off that similar sparkling white look. Gold came from the Latin word “aurum” and white gold is an alloy (combination of metals) which shines like a mirror due to its white metal plating. The usual combination is 90% gold and 10% nickel. In the jewel industry, it is often loosely referring to any gold alloy with a whitish hue. Thus, it covers a range of colors from pale rose to pale yellow. Rhodium plating is also usually used to give off that silvery glow shown in advertisements. Silver came from the Latin term “argentum” which means “white” or “shiny”. It is a pure chemical element and has the highest reflectivity as well as thermal and electrical conductivity as compared to any pure metal. Native silver, which is the pure elemental form and found in the earth’s crust, occurs at 0.08 parts per million. 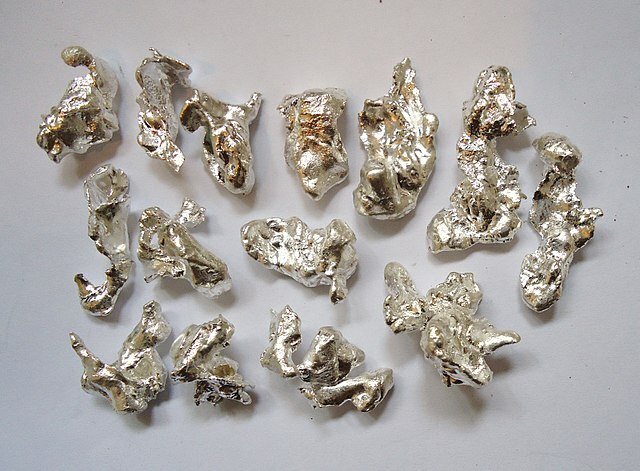 Silver is most often formed as a byproduct of refining gold, zinc, lead, and copper. White gold is an alloy since it is formed by combining pure gold with a white metal. On the other hand, silver is a pure element. As white gold is rarer and durable, it is likewise more expensive than silver. White gold is more scratch-resistant as compared to silver. As compared to silver, white gold corrodes less easily. White gold is often plated with rhodium for its mirror-like look while silver does not need such plating for its gray luster. It is usually easier to carve on white gold as it is more malleable than silver. White gold is marked in karats or purity percentage while silver is marked in purity percentage only. As silver is purer, it only has a gray shade. On the other hand, white gold can have a yellowish shade as well as a grayish one which largely depends on its plating. The symbol of silver, is “Ag”, from the Latin word “argentum” which means “shiny” or “white” whereas the symbol for the main component of white gold is “Au” from the Latin word “aurum” which literally means “gold”. Copper or Nickel is usually added to silver while rhodium, nickel, or palladium is usually mixed with gold. As compared to gold, silver is more naturally abundant. White gold is more expensive as it is harder to produce. Aside from ornamental purposes, silver is also used in medicine, confectionary, and engineering. On the contrary, white gold is solely used in jewelry or other ornamental pieces. White gold is classified according to the karats of pure gold used, whether it is 14k or 18k, and its main alloy, whether nickel or palladium. There are usually four classifications. As for silver, it is classified to the percentage of silver (99.99%, 92.5%, or 5-10%) and its alloys (copper, germanium, nickel, brass). Silver jewelry can be as pure as 99.99% while white gold ones can only be as pure as 75%. Both white gold and silver give off that mirror-like shine and are highly used in the jewelry industry. White gold is an alloy while silver is a pure element. As compared to silver, white gold is more expensive since it is more durable and rarer. White gold may be marked in karats while silver is only marked in purity percentage. It is easier to carve on gold as it is more malleable. Silver has a shade of gray while white gold may also have a yellowish hue. While white gold is mainly utilized as an ornament, silver may also have other practical uses. The main alloys used for white gold are palladium and nickel while that of silver are copper, nickel, and brass. In jewelry, the silver content can be as high as 99.99%. However, white gold’s content can only be as high as 75%. gene balinggan. 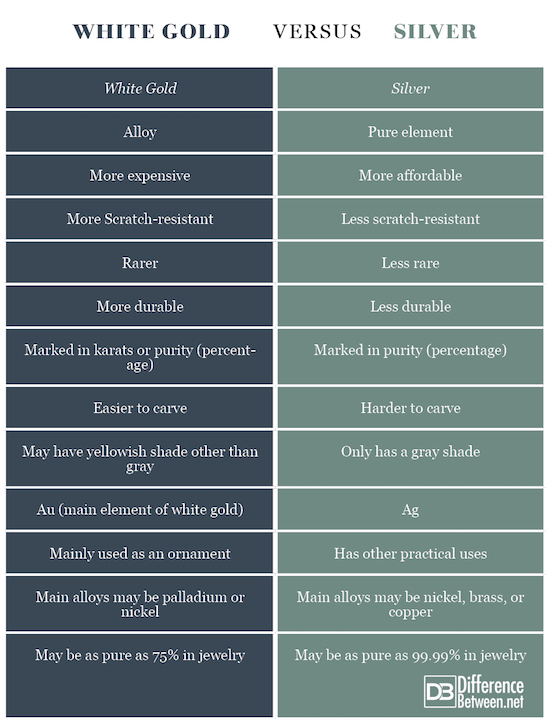 "Difference Between White Gold and Silver." DifferenceBetween.net. July 23, 2018 < http://www.differencebetween.net/object/difference-between-white-gold-and-silver/ >. Binnion, James. Jewelry Metals. Massachusetts: Manufacturing Jewelers and Suppliers of America, 2015. Print. McGrath, Jinks. The Complete Jewelry Making Course. Hongkong: Barrons, 2007. Print. Muttit, Louise Mary. Making Silver Jewelry. Ramsbury: The Crowood Press, 2014. Print.